Congratulations to Spalding County 4-H for bringing home second place honors in the recent Wildlife Habitat Education Program (WHEP) national contest, held July 27-30, 2014, in Missouri. 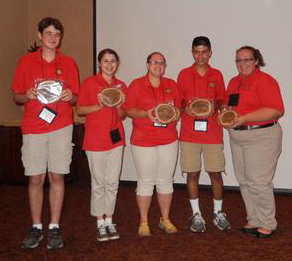 The team representing Georgia 4-H was comprised of (from L-R) Nathaniel Haulk, Hannah Rutledge, coach Alexa Robinson, Francisco Javier Zepeda, and Carrianna Simmons. Spalding County 4-H agent Cherry Hovatter also accompanied the team on the trip.